Call it a more unpleasant version of staring at the tea leaves. 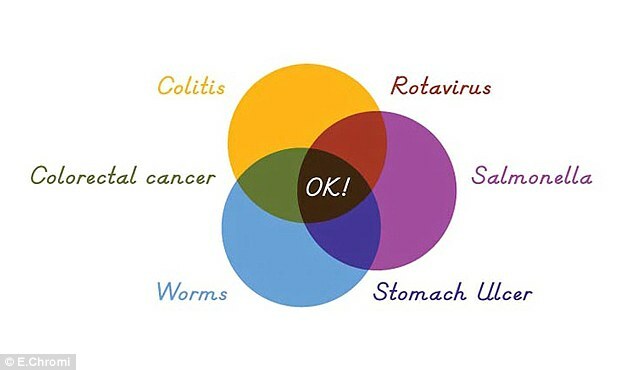 Researchers are suggesting a way to tell if a person is ill by changing their poop to different colours. 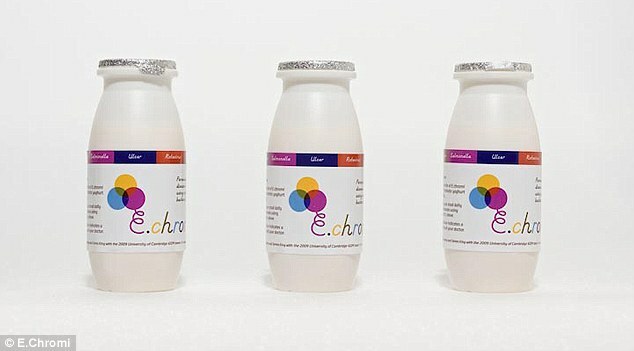 Swill down a yoghurt-style drink which interacts with the food in your stomach and your excrement turns a variety of hues depending on how sick you are. The scientists have so far only suggested it could detect the progress of e.coli – but they hope one day it could diagnose far more conditions. Even colorectal cancer, worms or a stomach ulcer could one day be pinpointed by people peering into the toilet until no brown remains. The process has been developed by British designers Alexandra Daisy Ginsberg and James King. 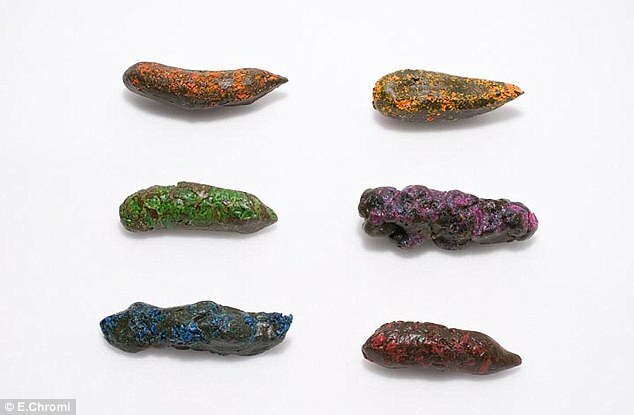 They have been taking their project – which is still in the preliminary stage – on the road and greeting the public with a display case containing what appears to be six dried multi-coloured poops lined up next to each other. Mr King also dons a disturbing picture of the human gut on his T-shirt with colourful lumps going through the intestines to illustrate the process. He and Ms Ginsberg suggest a diagnosis where a special blend of BioBricks, or standardized sequences of DNA, which interact with the E.coli and turn red, yellow, green, blue, brown or violet depending on how advanced the condition is. Test subjects would simply have to drink a special concoction and diagnose themselves by looking at their poop. In future the process could also be used to check for colitis, salmonella or Rotavirus, making it a cheap and effective solution for developing countries. It could also check if drinking water is safe by turning red if it is toxic. Mr King and Ms Ginsberg met whilst studying at Royal College of Art in London, and their work has attracted the attention of synthetic biologists who are seeking to make it a reality.